Who were the witnesses at the marriage of Padmé Amidala and Anakin Skywalker? If you are looking for who served as 'Witnesses' in the legal sense, no one, really, unless you are counting the droids, C3P0 and R2D2. 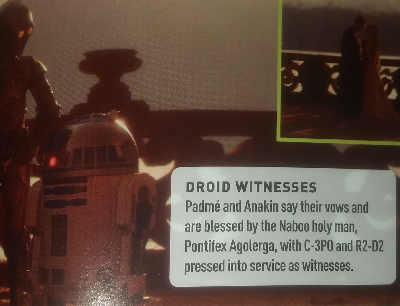 Per the old Starwars Databank, the ceremony was performed by Maxiron Agolerga, the Pontifex of the Brotherhood of Cognizance, but only the droids were in attendance, and Maxiron was advised that he had to keep the knowledge of the marriage to himself. Since Agolerga had agreed to the request, the two droids came to pick him up in a gondola speeder and brought him to Varykino across the Lake Country. The Pontifex, dressed in his holy purple garments, met the beautiful young couple that just wanted to be known as Veré and Set, two eternal lovers from an old Futhork legend. The matrimony was short and by the power invested by the Pontifex, Set and Veré were pronounced husband and wife. When Agolerga was about to leave, the groom waved his hand and spoke kindly to him that nobody could ever be told about this marriage. And thus the only remaining evidence was an official scroll containing their "names" to be classified in the archives of the Brotherhood. I don't know how 'canon' this is considered, but I believe it is consistent with what we saw in the movies. I believe there may be more info in the Novelization of Attack of the Clones, but I don't have a copy to verify that with. On distant Naboo, in a rose-covered arbor overlooking the sparkling lake, Anakin and Padmé stood hand in hand, Anakin in his formal Jedi robes and Padmé in a beautiful white gown with flowered trim. Anakin’s new mechanical arm hung at his side, the fingers clenching and opening in reflexive movements. Before them stood a Naboo holy man, his hands raised above their heads as he recited the ancient texts of marriage. And when the proclamation was made, R2-D2 and C-3PO, bearing witness to the union, whistled and clapped. And Anakin Skywalker and Padmé Amidala shared their first kiss as husband and wife. If Padmé had ever thought about her wedding, she had pictured a formal ceremony with her family and friends as witnesses. She had never, in her wildest dreams, expected to be married secretly on an isolated island with only a pair of droids to watch the Holy Man’s blessing. But she was here, and she could imagine no more perfect place to marry Anakin than the balcony of this lake lodge where she had begun to discover her love for him. The roses in the garden below were past their prime, shedding petals at the slightest breeze. The fading flowers drenched the air with their perfume. Was Anakin and Padmé's wedding legitimate? Does marriage exist in the Star Wars universe? What are the official Star Wars books involving Anakin Skywalker? How did humans end up in space if Star Wars is set in the past? Did Anakin Skywalker draw upon the Dark Side when he slaughtered the Sand People? How did Anakin Skywalker get into the Trade Federation Droid Control Ship?